Government employees in California cannot keep the public from seeing their work-related emails and texts sent on personal devices and through private accounts, the state's Supreme Court ruled unanimously Thursday, closing a loophole that justices said could have allowed the "most sensitive and potentially damning" communications to be shielded. With the ruling, California joins a growing list of states that treat public business done through private accounts as public records. "This ruling is a model for giving government transparency laws meaning in the digital age," said Matthew Cagle, an attorney at the American Civil Liberties Union of Northern California, which filed a brief in the case. 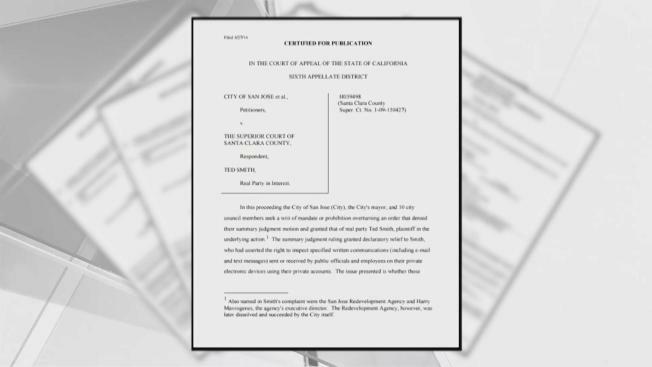 The ruling came in a lawsuit against the city of San Jose. City Attorney Richard Doyle said he was not surprised by the decision and did not plan to challenge it. But he said it raised practical challenges for cities and counties. "The question is how do we access those communications on personal devices without the government being overly intrusive," he said. "I don't expect and intend to have people turn over their phones." Newsom's office has previously said his personal emails are searched in response to Public Records Act requests. The state Supreme Court ruling applies to those top officials as well as lower-level city, county and state officials, and public employees. It does not apply to the state Legislature, which has its own public records policy. Many state courts and attorneys general have concluded that official communications on personal devices are subject to public disclosure. At the federal level, an appeals court ruled last year that work-related emails from a private account used by the White House's top science adviser were subject to disclosure under federal open records laws. Opponents have raised privacy concerns and said public officials sometimes need confidentiality to discuss unpopular views. They have also argued that sifting through employees' private accounts and devices in response to requests for records would be expensive and burdensome. San Jose said in court documents that forcing employees to turn over their passwords to inspect communications on private devices would be akin to making them hand over their house keys. Associate Justice Carol Corrigan said in the ruling that privacy concerns should be addressed on a case-by-case basis and officials could redact any personal information not related to public business. She said employees could also search their own personal accounts in response to records requests. "If communications sent through personal accounts were categorically excluded from (the California Public Records Act), government officials could hide their most sensitive, and potentially damning, discussions in such accounts," the justice said. The lawsuit before the high court was filed by Ted Smith, who in 2009 requested messages about development in downtown San Jose that were sent or received on private devices used by the mayor and City Council. The city said it did not have access to any messages created on personal devices, so they were not public records. A Superior Court judge ruled in his favor, but an appeals court overturned that decision in 2014. The Supreme Court did not rule on the merits of Smith's specific request, instead sending the case back to a lower court for that determination. Attorney Jim McManis took the case all the way up to the Supreme Court and applauded its decision. "I'm thrilled," he said. "It's a great decision, strong opinion. Seven to nothing — couldn't be better."